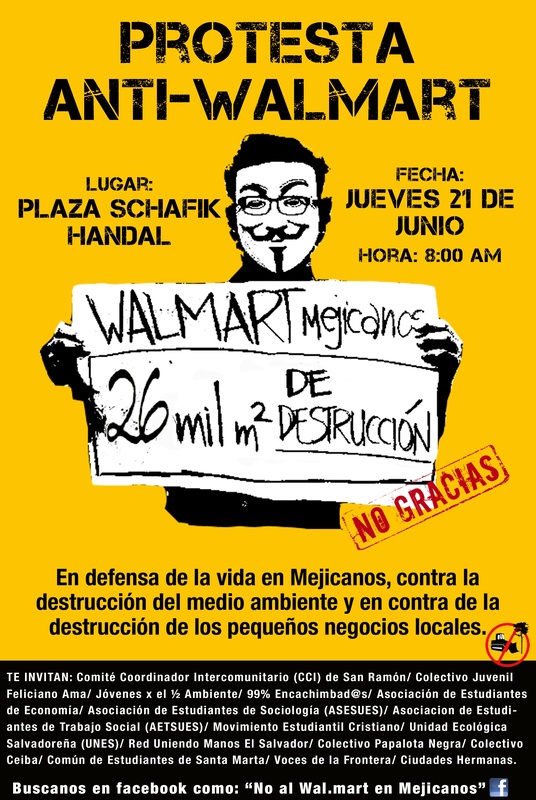 This past Thursday civil society organizations, international solidarity groups, students, and community associations came together to protest the construction of a mega Walmart store in Mejicanos, a municipality in northern San Salvador. According to community leaders , construction of the super-store poses a serious risk to the surrounding communities along the folds of the San Salvador volcano. Mejicanos is already ranked as the third most vulnerable urban center in El Salvador, and 45% of the households lack at least one basic service such as water, electricity or proper shelter. Mauricio Cortéz of the Inter Communal Coordinating Committee has been demanding answers to the various risks that the municipality faces for decades. The Picacho ravine of the volcano is unstable, and residents fear a repeat of the devastating 1934 and 1982 landslides that covered entire communities. Intense urbanization has forced poor families off of the their land in favor of up-scale residential development and new boulevards – projects which heavily impact watershed patterns and hill side stability. Rene Bermudez, who has been part of the Walmart resistance movement for the past 5 years, also denounced Walmart’s demolition of an important access road along the parameter of the property. Municipal land-use maps establish the Arenal road to provide residents of Las Marias access to their community. In order to prepare for the new Walmart, contractors bulldozed the road claiming that it was just a drainage ditch. Las Marias residents now have to use a winding path through residential properties. Today’s protest was in response to the new mayor’s sudden approval for the construction permits. Prior permits had been denied due Walmart’s inability to meet environmental regulations, but within weeks of taking office, the new conservative mayor, Juanita Lemus de Pacas, announced that Walmart would be open by December of this year. 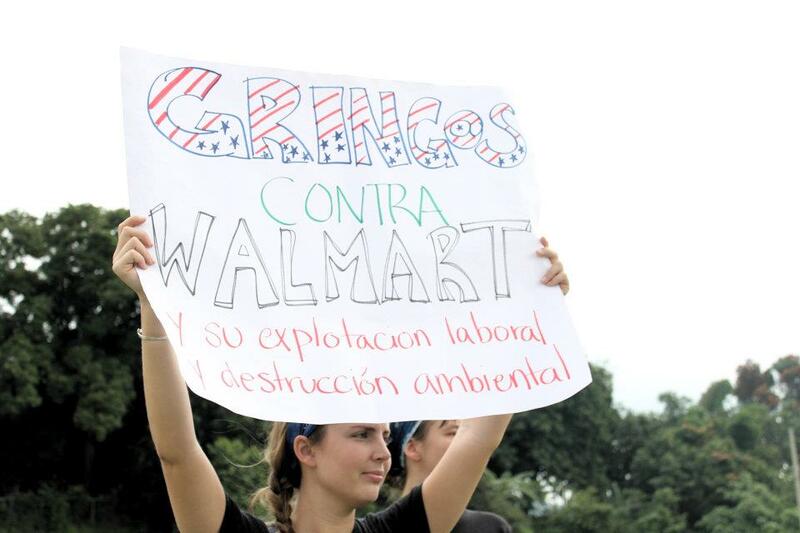 Walmart has been in Central America since 2005 and is already the region’s largest retailer. Walmart Centroamérica has 79 stores open in El Salvador; Despensa Familiar – 51; La Despensa de Don Juan -25; Walmart Supercenter – 2; and Maxi Despensa -1. Community leaders are upset by the mayor’s eager support of the project, and have signaled that Walmart was able to cull favor with the new administration through tactics that were similar to those used in Mexico and exposed this past April. Lemus de Pacas’ entire campaign was based on inviting large business contracts into the area, and she has continued to align the mayor’s office with private interests. Gloria Andrade, a community leader in San Pedro, Mejicanos, said that local market women had planned on participating in the protest, but the mayor threatened to pull funds for their new market if they were to attend. FLASCO, Mapa de Pobreza urbana y exclución social. FLASCO-MINED. 2008. Last month, Walmart received permits to build a store in Mejicanos, a municipality within the greater Metropolitan San Salvador Area. The 86,100 square foot store will be located on a lovely 6.6-acre lot on the Constitution Boulevard, at the base of the San Salvador Volcano. Walmart officials estimate that the store will create 500 new direct jobs and 250 new indirect jobs and inject a bunch of new tax revenue into the local and central governments. Sadly, the 6.6 acres where Walmart is going to build was a forest, which was removed to accommodate the large building and parking lots. There will probably be more illicit processes in the acquisition of permits; which could include corruption and intimidation. Anticipating that Salvadorans would not appreciate their cutting down trees, the mega-giant store plans to plant 10,000 trees in a deforested areas in the nearby municipality of Nejapa. Whether their reforestation efforts will offset losing 6.6 acres of forest at the base of the volcano remains unclear, but opponents are doubtful. 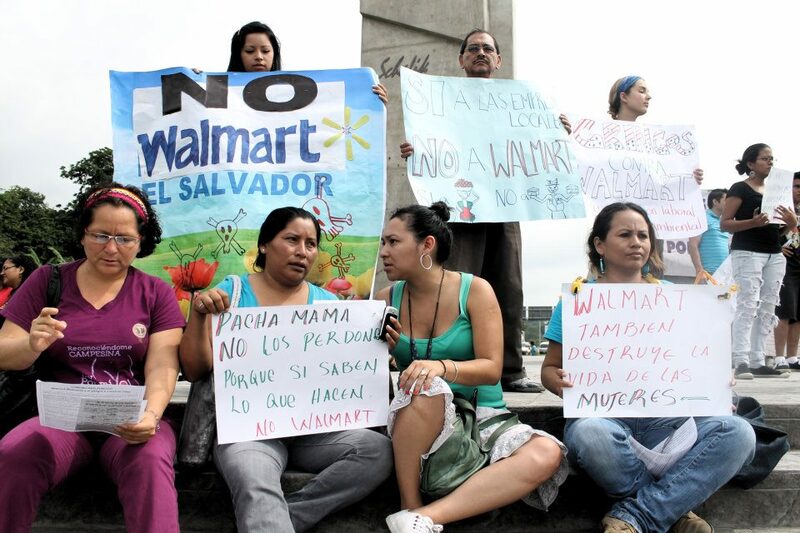 Elsalvador.com published an article on May 1st of this year giving the new ARENA mayor, Juanita Lemus de Pacas, credit for getting Walmart the permits they need to start building. Up to the March 2012 elections, the leftist FMLN party had held the mayor’s office in Mejicanos and Walmart was unable to secure their permits. Shortly after the new ARENA government took over the municipal government, Walmart broke ground on the project.